Stepping into the Butterfly and the Pig almost feels like you are going to your strange grandparent’s house for dinner. Packed full of mis-matched kitsch furniture, the bar has a very warm and homey atmosphere and seems an ideal place to sink into an armchair and relax for a few hours with a couple of beers or even a good cup of tea. 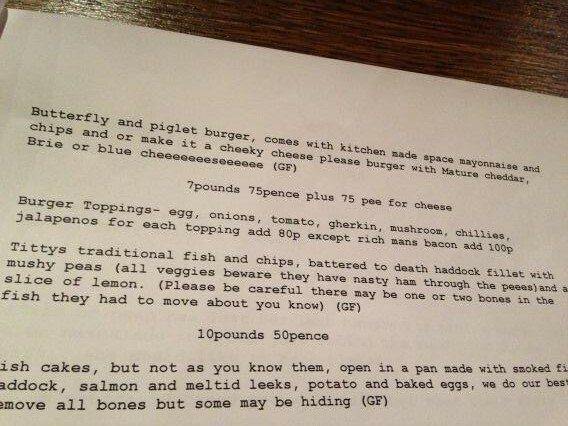 The menu is written like a storybook and this, along with the mis-matched plates, cutlery and just about every piece of furniture in the bar make the Butterfly and the Pig one of the most unique hangouts in Glasgow. Reading the menu, we spotted not only the Butterfly and the Pig’s house burger (titled the ‘butterly and piglet burger’) but a lamb burger on the specials menu that was described as being topped with red onion marmalade and served with a portion of onion rings and we decided that we’d order both for the review. When we arrived at the bar, a member of staff came over to our table and took our drinks orders immediately and we had our drinks a couple of minutes later; however, after being served our drinks we waited 30 minutes with nobody coming over to our table to take our order. With the hunger becoming too much to handle, I went to the bar to order. I almost expected the member of staff at the bar to realise that he’d forgotten to come and take our order or say that he was just coming over to our table, but he simply asked ‘what can I get you?’. Initially, I was a little unsure if customers were supposed to go to the bar and order food themselves here; however, there were no signs or anything else to indicate this. Later on, as we were leaving, I noticed other customers’ orders being taken at their table. Slow service aside, most of the staff members were very chatty and friendly and I was looking forward to trying both burgers. Presentation wise, the ‘Butterfly and piglet’ burger looked good for the most part; however, the bun let the look of the burger down. The patty comes served with one of the standard, flour-dusted buns that you’ll no doubt have seen used in quite a few restaurants all over the UK. I’ve never been a fan of these buns and have always found that as well as looking cheap, they also don’t deliver much in the taste department. Aside from the bun, this burger looked good. The fried egg was perfectly cooked and the melted brie mouth-wateringly oozed out of the sides of the bun. Inside the house burger. So much egg and cheese. It was good! Taste wise, the burger delivered; however, this was partly due to the toppings that I had added to my order. On it’s own, I’m not sure how this patty would fare if it were just sandwiched between the floured bun with nothing except a light dressing of mayo. The patty wasn’t bad – it was big, juicy and well cooked, but I felt that I’d have gotten rather bored of the burger if I’d simply had it on it’s own. The brie was perfectly melted and there was lots of it! As I took a bite out of the burger, the egg yolk burst and it melted into the brie absolutely perfectly. Combined with the ‘space mayo’, the combination of all of the toppings created a fantastic flavour that almost made up for the poor bun. The only other issue I had was that the because the bun was poor, it fell apart towards the end. 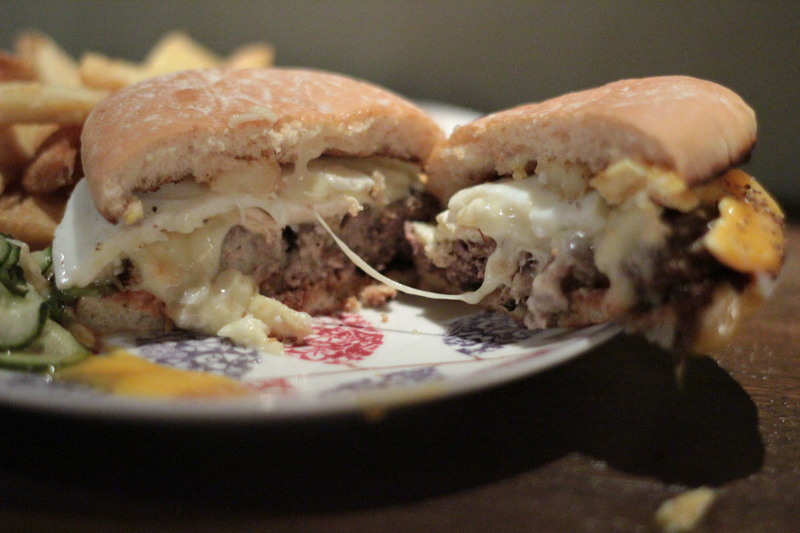 It was toasted around the edges and soft in the middle, meaning that the melted cheese and juice from the patty caused it to tear apart, resulting in very messy hands. The lamb special, on the other hand, wasn’t so great. Presentation wise, it seemed a little smaller than the first burger. The same bun was used; however as there wasn’t as many toppings on this one, the issue of if breaking apart was non-existent. 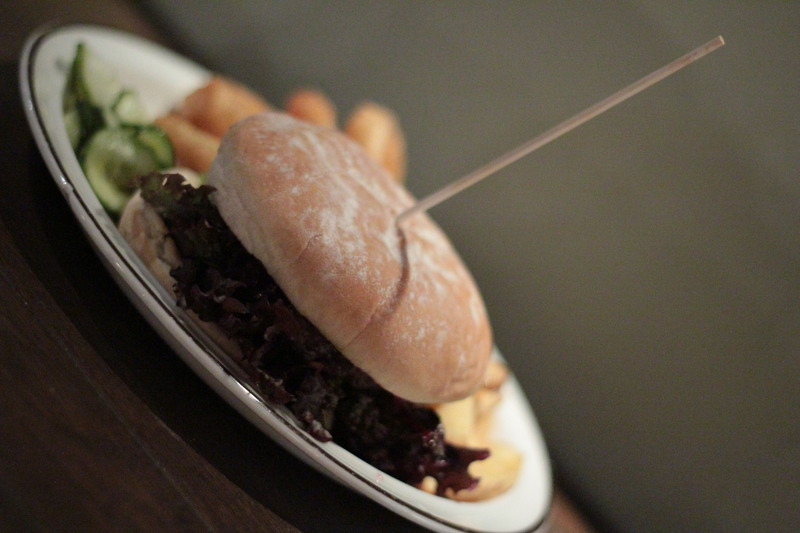 The patty itself; however, was very dry and had a very overpowering flavour of mint throughout. My issue with this was that the mint was not advertised on the menu, because if it had been, I wouldn’t have ordered the burger. I’m not a fan of mint in lamb burgers, but would normally be able to tolerate it if it was mild enough; however, it was incredibly strong in this burger, almost to the point where it was all I could taste. Even the excellent red onion relish that topped the burger couldn’t block out the flavour and instead created a very odd-tasting fruity mint aftertaste that wasn’t at all enjoyable. Between two, we couldn’t even get through half of it and decided to give up. 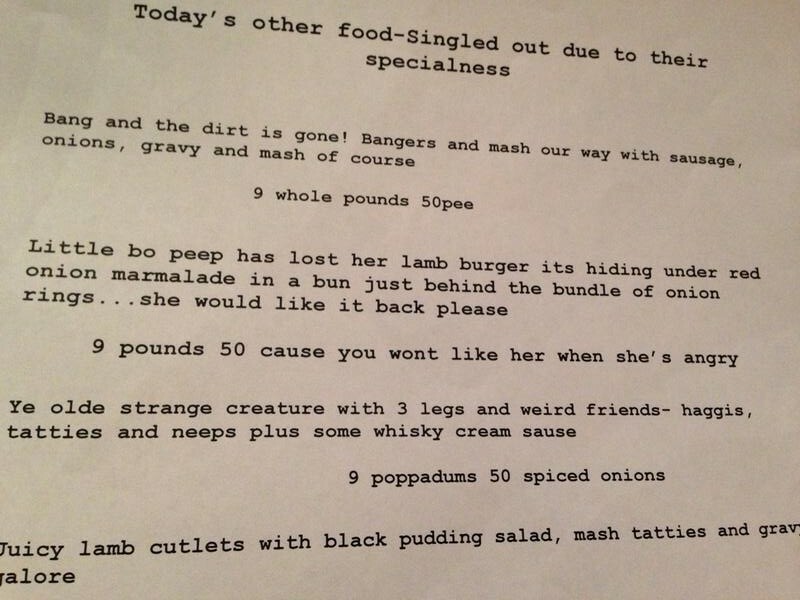 At £9.50, I certainly wouldn’t recommend this special burger to anyone. Both burgers came served with a large portion of chunky fries, which reminded me of ones you would get from your local chippy. Delicious! Inside the lamb burger. Tasty relish and a decent size but the mint let it down. I had mixed feelings as I left the Butterfly and the pig. 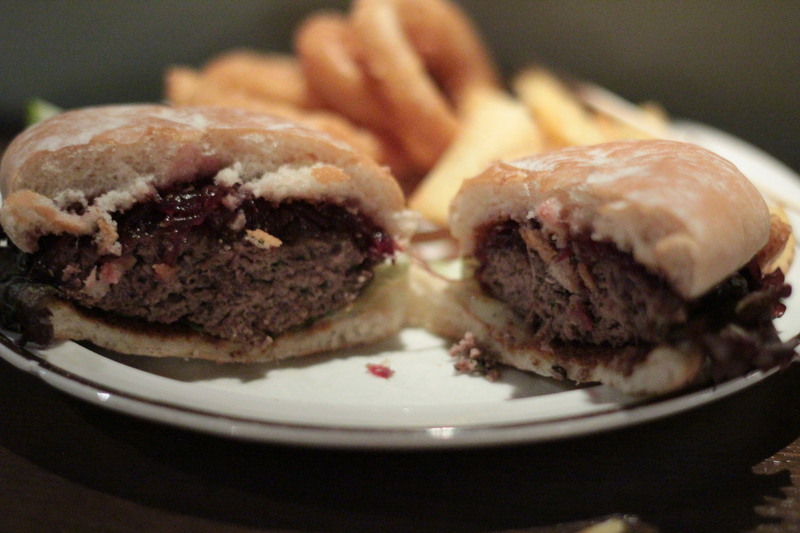 I very much enjoyed the house burger, which certainly delivered on flavour and size, despite the poor bun. The lamb burger on the other hand, was extremely disappointing and the overpowering flavour of mint combined with a slightly dry patty ruined what might have been a fairly good dish. I felt that the addition of the mint should have been noted on the menu, as while I’m a big fan of lamb, I’d much rather eat mints after my burger and not with it. Despite one not-so-good burger and very slow service, I’d still recommend the house burger – as long as you make sure and top it with brie and a fried egg! If the Butterfly and the Pig were to change the burger buns that they use, they could have one of the best burgers on Bath street on their hands. I’d happily go back again, take in some of that homey, warm, laid back atmosphere and eat this again if a few minor changes were implemented. – Lamb burger was dry. 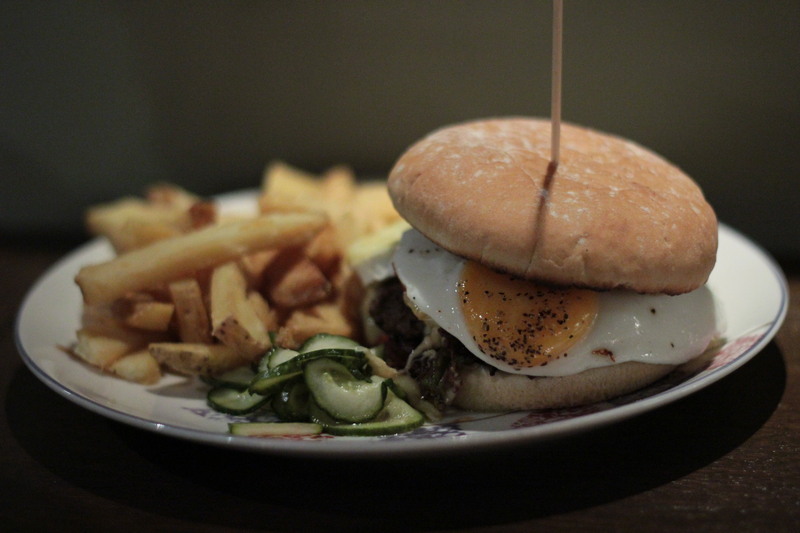 – Intense, overpowering mint flavouring in the lamb burger. – While the staff were friendly, the service was slow. I had to go to the bar to order food after waiting 30 minutes.